This report recommended a fuel reduction program that treats land based on risk, rather than who is responsible for its management. In 2014 the Tasmanian Government then invested $28.5 million over for four years for an Australian-first scientific program of strategically targeted burns, to reduce the amount of potential fuel for a bushfire. This cross-agency, whole-of-state fuel reduction program focusses on those areas that pose the greatest risk of bushfire. An ongoing commitment to the program will reduce the long-term risk of catastrophic fires. For the first time, this Fuel Reduction Program includes both public and private land. The Fuel Reduction Program is being overseen by the Fuel Reduction Unit within the Tasmania Fire Service. The unit is working with the Parks and Wildlife Service, Forestry Tasmania, local government, contractors and private land owners to implement the program. 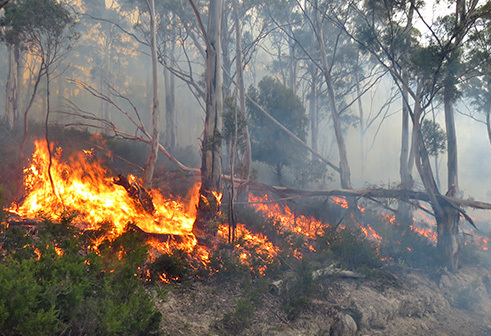 Parks and Wildlife Service and Forestry Tasmania will also be conducting their own burning programs.